Asteroid #12 Victoria was discovered by J. R. Hind. 12 Victoria is a large Main belt asteroid, probably composed of silicate rock and nickel-iron, discovered by John Russell Hind on 13 September 1850. Radar and speckle interferometry observations show that the shape of Victoria is elongated, and it is suspected to be a binary asteroid. Victoria has only been observed to occult stars 3 times. Victoria is officially named after the Roman goddess of victory, but the name also honors Queen Victoria of the United Kingdom. The goddess Victoria (Nike for the Greeks) was the daughter of Styx by the Titan Pallas in Roman mythology. The coincidence with the then-reigning British queen's name caused quite a controversy at the time of discovery, and B. A. Gould, editor of the prestigious Astronomical Journal, adopted the alternate name Clio (now used by 84 Klio) proposed by the discoverer. However, W. C. Bond, of the Harvard College Observatory, then the highest authority on astronomy in America, held that the mythological condition was fulfilled and the name Victoria was therefore acceptable, and his opinion eventually prevailed. J. C. Watson discovered asteroid #104 Klymene. Lewis Latimer invented and patented an electric lamp with a carbon filament. M. Wolf and A. Schwassmann discovered asteroid #436 Patricia. The first airplane flight in Europe took place when Alberto Santos-Dumont successfully flew his Santos-Dumont 14-bis aircraft for the first time, on the grounds of the Chateau de Bagatelle in the Bois de Boulogne public park in Paris. J. H. Metcalf discovered asteroid #645 Agrippina. G. Neujmin discovered asteroid #877 Walkure. J. Palisa discovered asteroid #903 Nealley. K. Reinmuth discovered asteroid #1003 Lilofee. E. Delporte discovered asteroid #1068 Nofretete. G. Neujmin discovered asteroid #1099 Figneria. H. Van Gent discovered asteroids #1132 Hollandia and #1133 Lugduna. G. Neujmin discovered asteroid #1202 Marina. Y. Vaisala discovered asteroid #1406 Komppa. M. Itzigsohn discovered asteroid #1589 Fanatica. Goethe Link Observatory discovered asteroids #2227 Otto Struve and #3167. 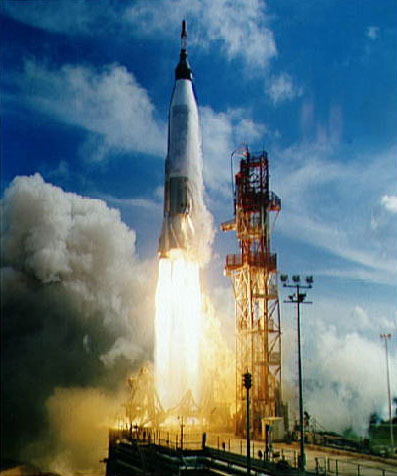 NASA launched Mercury-Atlas 4 (MA-4), the first orbital flight in the Mercury program, as a successful unmanned test of all systems, network, and recovery forces. Mercury-Atlas 4 (MA-4) was launched 13 September 1961 from Cape Canaveral, Florida, with special vibration and noise instrumentation and a mechanical crewman simulator aboard, in addition to the normal spacecraft equipment. It was an orbital test of the Mercury Tracking Network, and the first successful orbital flight test of the Mercury program. (All previous successful launches were suborbital.) The payload consisted of a pilot simulator (to test the environmental controls), two voice tapes (to check the tracking network), a life support system, three cameras, and instrumentation to monitor levels of noise, vibration and radiation. The orbital apogee was 123 nautical miles and the perigee was 86 nautical miles. After one orbit, the spacecraft's orbital timing device triggered the retrograde rockets, and the spacecraft splashed in the Atlantic Ocean 161 miles east of Bermuda. A circuit anomaly in the control system caused the landing to occur 120 km uprange from its intended target. Recovery was made 82 minutes after splash-down by the destroyer USS Decatur. During the flight, only three slight deviations were noted - a small leak in the oxygen system; loss of voice contact over Australia; and the failure of an inverter in the environmental control system. Overall, the flight was highly successful: the Atlas booster performed well and demonstrated that it was ready for the manned flight, the spacecraft systems operated well, and the Mercury global tracking network and telemetry operated in an excellent manner and was ready to support manned orbital flight. The flight demonstrated the ability of the Atlas rocket to lift the Mercury capsule into orbit, of the capsule and its systems to operate completely autonomously, and succeeded in obtaining pictures of the Earth. C. Hoffmeister discovered asteroid #3674 Erbisbuhl. NASA and the USAF launched X-15A WTR/HS/SB/FAB/FP Test/Technology/Aeronomy mission # 198 in which Pete Knight attained a maximum speed of 5992 kph (Mach 5.37), and reached a maximum altitude of 77.450 km. The first Concorde landing at Heathrow airport took place. N. Chernykh discovered asteroids #2372 Proskurin and #2951; S. J. Bus and T. Lauer discovered asteroid #2735 Ellen. NASA test pilots Engle and Truly flew Enterprise flight 5, the second free flight of the shuttle testbed, which landed on lake bed Runway 17 at Edwards Air Force Base, California, 5 minutes 28 seconds after it was released from the carrier aircraft. ESA's Orbital Test Satellite (OTS 1) was launched from Cape Canaveral, Florida, on a Delta 3914 rocket, but did not reach orbit because the vehicle exploded, probably due to a solid rocket motor (SRM) case failure. P. Wild discovered asteroid #2239 Paracelsus; N. Chernykh discovered asteroids #2724 Orlov, #2787 Tovarishch, #2810 Lev Tolstoj, #2883 Barabashov, #3189, #3359 and #3710. C. Kowal discovered asteroid #2629. C. and E. Shoemaker discovered asteroid #3199 Nefertiti; Oak Ridge Observatory discovered asteroid #3076. The US performed the first successful ASAT interception, destroying a target satellite with an air-launched intercept rocket. The first successful test interception and destruction of a satellite in space was performed on 13 September 1983. The ASAT (Air-Launched Anti-Satellite Missile) was designed and developed by Vought in response to a 1977 Air Force requirement for a small air-launched missile that was capable of intercepting and destroying enemy satellites in low Earth orbit. The missile consisted of a modified Short Range Attack Missile (SRAM) first stage, a Thiokol Altair III second stage, and a Vought miniature homing vehicle (MHV). The ASAT was launched from an F-15 fighter in a steep climb at a high altitude, which gave the ASAT's rocket a useful initial velocity to allow it to reach its target in orbit. After the first stage separated, the second stage propelled the MHV into space on a collision course with the target. The MHV destroyed the target by ramming it at high speed. The joint NASA/ESA Ulysses probe reached its maximum southern latitude of 80.2 degrees below the plane of the ecliptic, to observe the Sun's south pole.